Mix 2 tsp oil in the flour and add salt. Sprinkle water to get a soft dough and keep covered for 15 minutes. Heat the jaggery with little water and when it gets to a ball consistency, switch off the gas and add coconut and cardamom powder. Mix well and let it cool for some time. Make small balls of it. Make balls of the dough, roll them into a small round and place the sweet ball in the center. Cover from all sides and repeat for the rest of the dough and fillings. 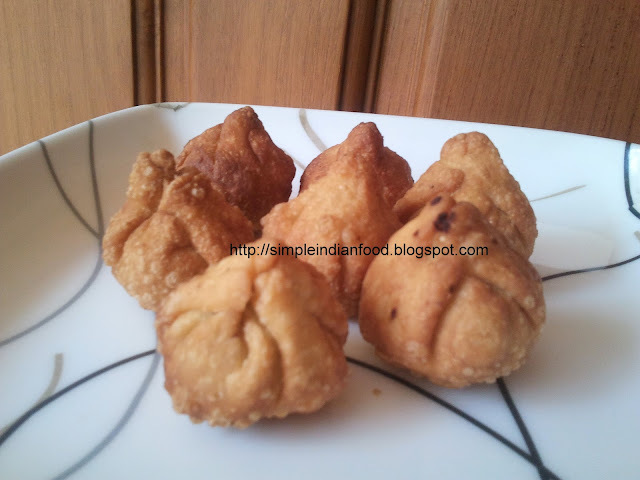 Fry these modaks on medium flame till golden brown and crisp.